Are You Built Well for Time Travel? Warning: This post contains spoilers from the first 10% of a book. Even just knowing the book paired with the subject line contains a spoiler from that portion of the book. 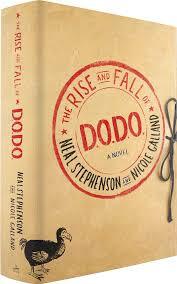 After reading Seveneves last year, I’m all-in on author Neal Stephenson. That’s why I’ve spent the past two months with The Rise and Fall of D.O.D.O. as my bedtime reading. The book, which is set in the modern day, starts with a rather interesting premise: magic is real. Rather, it was once real, but when technology reached a certain level in the 1850s, magic simply ceases to exist. Now there are a few people trying to rekindle it. In true Stephenson fashion, the process by which they go about accessing magic is incredibly detailed and scientific. I’m still not quite sure I understand it, but the key is that magic in the modern day is requires two things: (a) a special room in which the contents may or may not be alive and (b) a witch. Anyway, the title of this post comes from the idea that the organization who has sought to rekindle magic has done so because they want to send people back in time to subtly influence the past in such a way to improve the present. This is where they introduce a concept that I’ve never seen in time travel fiction: In D.O.D.O., when a witch sends you back in time, only your organic matter is teleported. So, no clothes, obviously, but we’ve seen that before. Beyond that, if you wear glasses/contacts, if you have tattoos, if you have any metal or plastic in your body (fillings in your teeth or a heart stint), if you have breast implants, etc…all of that stays behind. This results in a severe limitation to the applicable pool of people who can time travel. For example, I’m fine in most regards, but I had an unfortunate root canal about 10 years ago–I think that would provide some challenges up arrival in the past. What about you? Given that premise, would you be an ideal candidate for time travel? This entry was posted on Wednesday, August 9th, 2017 at 11:13 pm	and is filed under books and tagged with books. You can follow any responses to this entry through the RSS 2.0 feed. I’d be trouble. I’ve a mouthful of dental work and wear glasses/contacts – and definitely wouldn’t look like Arnie when arriving back in time naked. I think I’d mostly be okay, as long as I’ve been sent back to a time where corrective lenses (glasses) exist, or else I’d be stuck walking around and bumping into things due to blurry vision. Whoa this is such a good question! At first I thought I’d be great because I have great vision, no broken bones/pins/etc, only minor half-cavities, etc. But then I remembered that I had open heart surgery when I was an infant and there’s technically a tiny patch in my heart to repair the wall between the two ventricles – if it’s all grown over and fine, which I imagine it is, I thiiiiink the patch could disappear and I’d be okay but that’s a risky little game…I’ll be careful.